I hope you are well and have had a good week. As some of you know I have been here, there and everywhere with work recently. Just this week I have managed a trip to Cheltenham and Manchester, as well as time spent in our head office in Epsom. I've been really busy and exhausted a lot of the time, but I am pleased to report that I've had some brilliant news from work recently. I have been promoted! I am so proud of myself and I just wanted to share with everyone! 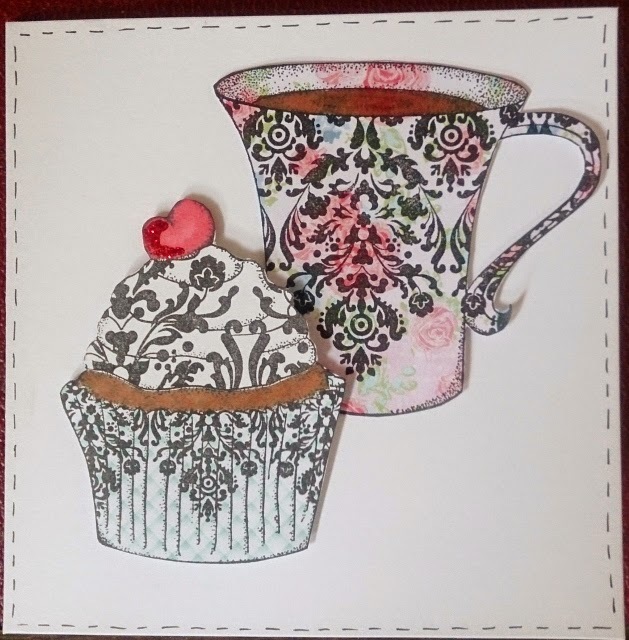 Anyway, enough of that...onto this week's challenge from Sweet Stampin. This week we would like to see your paper piecing skills....so grab your favourite stamp and papers and get crafting! I've taken two of my favourite stamps and a selection of pretty patterned papers. I have used my Promarkers to add a little details, as well as a little sparkle on the cherry with my Stickles. I have finished the card with some faux stitching around the edge. I'm really pleased with how this card has turned out and will probably make some more to send to family. There is also still a little time left to enter my fab afternoon tea competition over on my other blog. To find out more take a peek at Tea With Me and Friends! I like it a lot. Congratulations Wedgie! What Tracey said!! Tea, in a posh cup, and cake. What could be better. oooh tea and cake...nothing better! love the paper piecing too.